1. To prepare filling, mash pears (do not purée pears, mixture will be too liquid), then drain for 30 minutes. Thoroughly combine pears, Gouda cheese and garlic; reserve. 2. To prepare sauce, heat butter until it just begins to brown; stir in pine nuts, tomato, capers, salt and pepper. Shredded basil will be added before serving. Reserve sauce. 3. 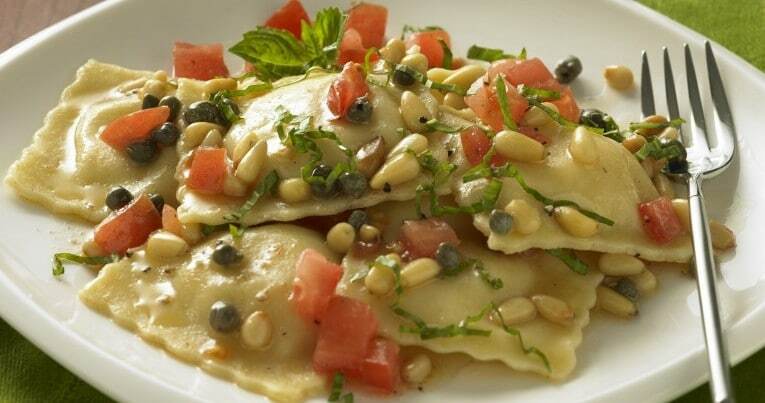 To Prepare Ravioli, cut 1 pasta sheet in half lengthwise. On first half sheet, starting about an inch from the edge, equally distribute 1 measuring teaspoon (mounded) of filling in 2 rows of 5 each. Brush edges and in between mounds with water. Cover the remaining half of pasta. Firmly press edges and in between mounds. Trim edges, then, evenly cut between mounds to form ravioli. Check edges; press again to seal firmly, if necessary. Repeat with remaining pasta sheets. Lightly dust ravioli with flour to prevent sticking. Cook ravioli in salted boiling water until just done, about 3 minutes. Meanwhile heat sauce and add shredded basil. When ravioli are done, drain well, and add to sauce. Cook a minute or two, basting ravioli with sauce. Plate and garnish with a basil sprig.